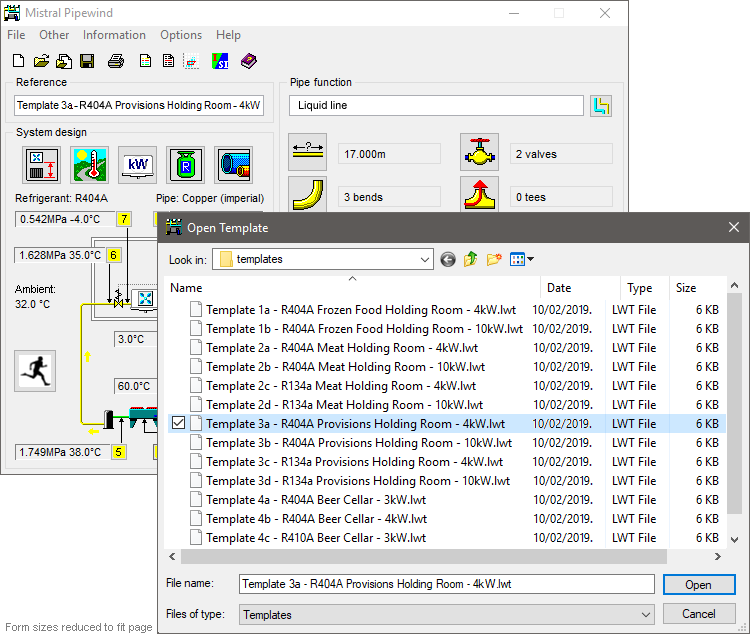 By popular request Mistral has increased the number of Instantly Selectable, pre-engineered pipe size Design Templates to 114. Arranged in refrigerant menus. Quite simply there is no easier or faster or more accurate way to size refrigerant pipework. An irksome task at the best of times when performed manually with calculator and tables. Especially when your customer asks you to relocate the unit coolers to the other side of the cold room an hour after you had just completed the task! And 'YES', we've all been there haven't we?! Responses to a recent industry wide questionnaire suggest that over 70% of all unit coolers installed in the UK are selected using Mistral software. The figure might actually be higher but as with all such on-line surveys not everyone responds. 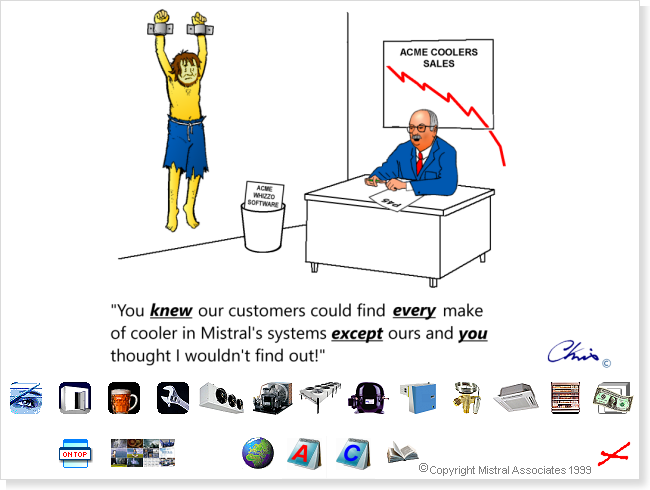 Still don't want your unit coolers featured alongside all your competitors' products in the one RAC Application Engineering software system that more than 85% of the industry uses? You have your own product selection software? Of course you do. So does everyone. Can four and a half thousand RAC contractors, in the UK alone, use your software to select your cooler then compare it with products from your competitors such as Eco, Frigabohn, Kelvion Searle, Küba Kältetechnik, Lu-Ve Contardo and Univap (and vice-versa). 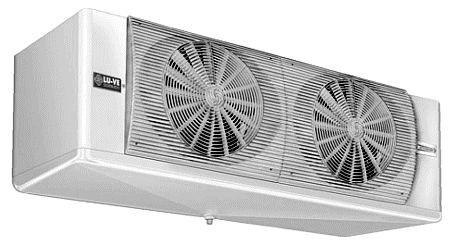 Then balance it against condensing unit ranges from Aspera, Bitzer, Copeland, Cubigel, Daikin, Danfoss, Dorin, Embraco, Frascold, Hawco, Hubbard, J & E Hall, KD, Kelvion, L'Unite Hermique, Maneurop, Marstair, MTH, Profroid, SDM Frigo, and Tecumseh. Whose software do you think four and a half thousand RAC contractors in the UK alone are using every day to select their unit coolers, condensing units, compressors, condensers and packaged systems? 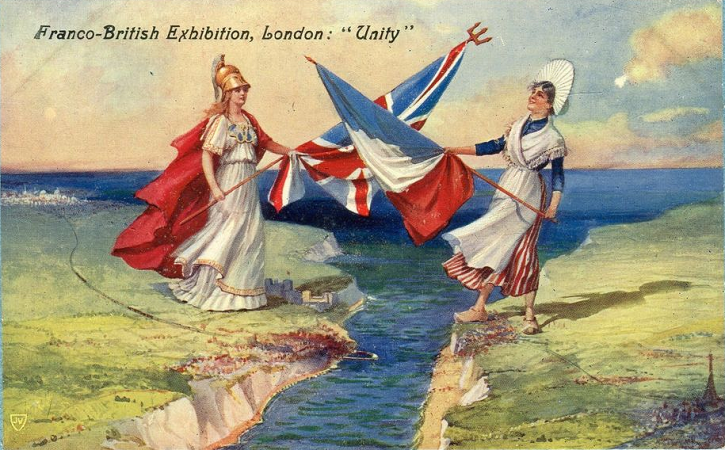 Celebrating Franco-British Exhibition, London, 1908. 'Airwind', 'Cellwind' and 'Coldwind' programs may have their operating language switched between English and (currently only*) French languages by opening the language selector menu by clicking the icon in each program's top menu bar. Switching languages completes instantly upon re-starting the program. Switching language back again is achieved simply by opening the language selector menu again. 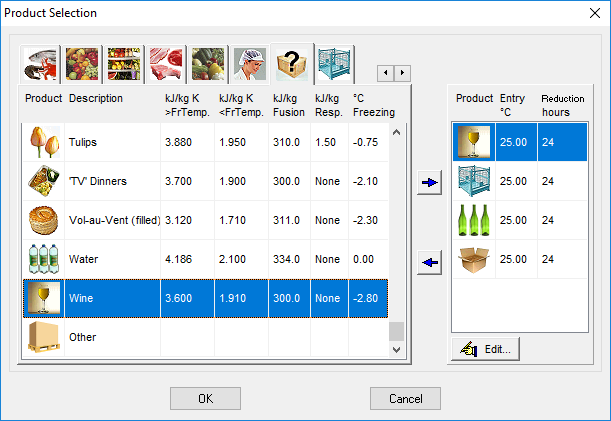 Quick selection calculations selected in menus will only function in their appropriately set language. * More languages are planned. Unlike other software, Mistral's programs are language switchable AFTER program installation and not just selected and thus fixed prior to installation. A far more useful facility. Cost to Mistral of researching, translating and re-coding over five million words in 19,000+ source code interface pages, including form titles and labels, instructions, cue cards, text string concatenations and error messages; along with linked Help pages and interactive database file text content. Circa 220,000 Euros. Coldroom dimensions - Internal or External ? The argument continues. Well perhaps not so much an argument but certainly a persistent debate. In the United Kingdom at least cold room designs are generally conducted based upon external room dimensions. At Mistral our programs have followed this practice from the beginning, over 30 years ago. When desktop computers weighed a tonne and ran on steam, or so it seems to us now. We had always assumed this being due to coldrooms, smaller ones in particular, generally being constructed inside another enveloping building space. This is not how they do things on the Continent however. In most European countries cold rooms are usually designed, sold and discussed using internal dimensions. Mistral thus supplied its programs in mainland Europe accordingly. Now you can have it both ways. From 1st April* Coldwind Pro will have the facility to switch back and forth between designing with either internal or external room dimensions. To minimize risk of confusion the program's operating dimension mode is clearly indicated at the top of the Room Designer form. To completely eliminate risk of potential and costly on-site errors calculation results filed in either mode will be respected and effectively 'locked' in whichever mode they were originally created in. * No, not an April Fool's joke! Cost to Mistral of redeveloping Coldwind Pro source code dimension routines and associated, linked functions. Circa 120,000 Euros. 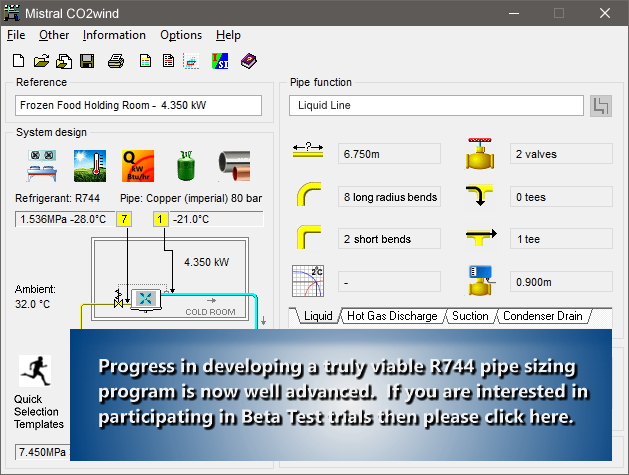 Progress in developing what will probably be the first ever truly viable R744 pipe sizing program is now well advanced. 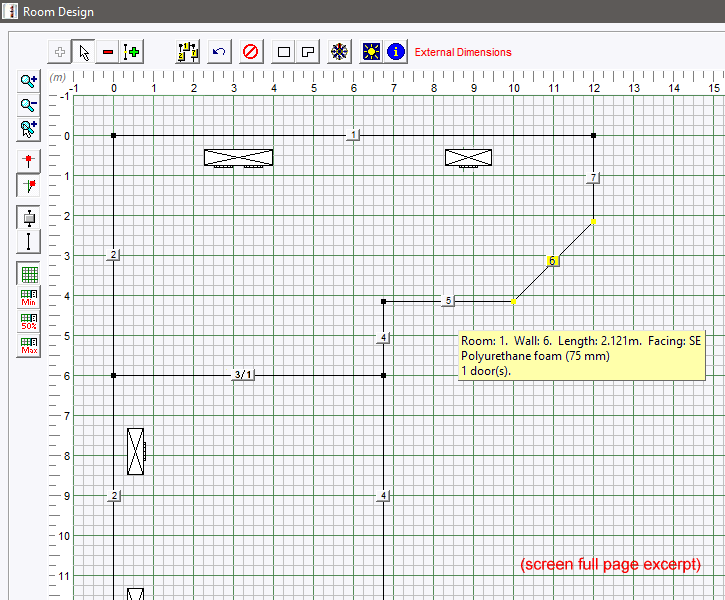 An extremely challenging, to say nothing of very expensive software project. If you are interested in participating in Beta Test trials then please click above image. Please be aware that not everyone who wishes to join the project will be selected and regrettably Mistral will not be able to enter into further correspondence with those not chosen. Not being chosen should not be considered as any reflection upon requesters' qualifications or suitability but merely a matter of logistics and of course First Come - First Served! See recent News features below to discover what has recently been added already. 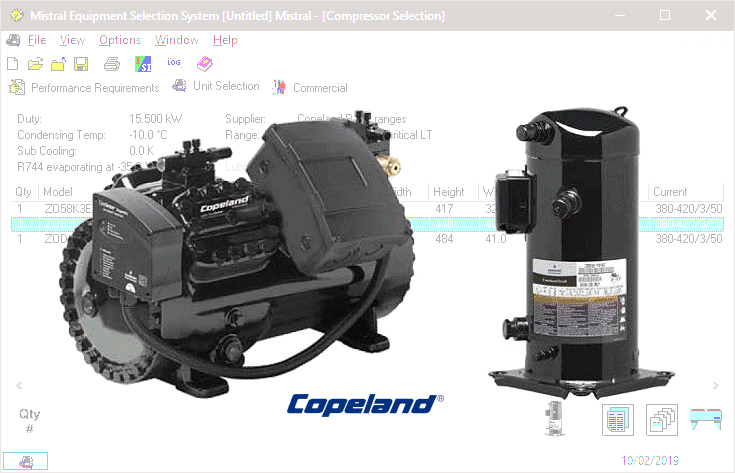 The latest are Copeland's ZO and ZOD Copeland Scroll compressor range for CO2 subcritical refrigeration and also 4MSL Stream range of compressors for subcritical applications where meeting high standstill pressure (90 bar) is needed. Cost to Mistral of researching, processing, compiling, proving and integrating new interactive Copeland R744 product selection databases: circa 1,800 Euros. 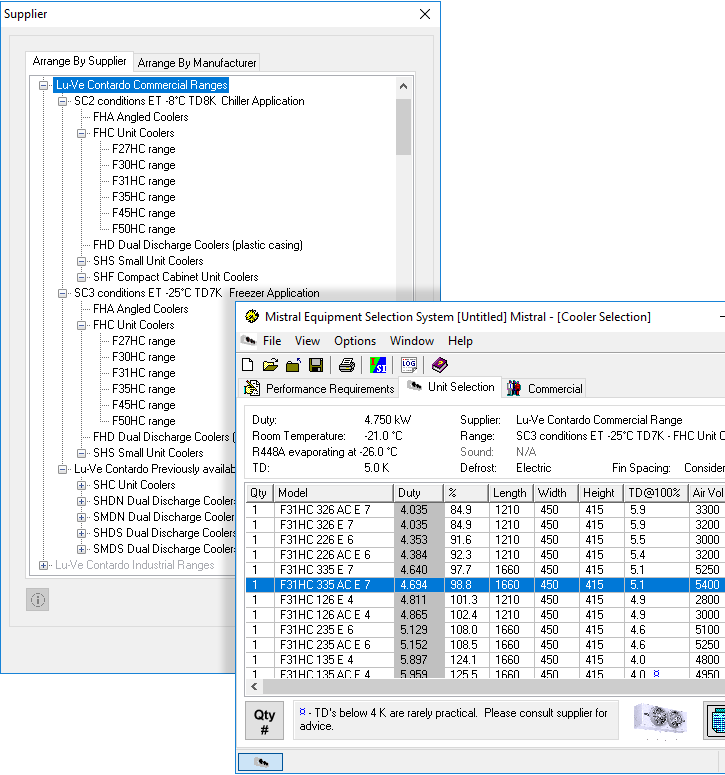 In response to ever increasing monitor sizes, coupled with ever decreasing pixel sizes, Mistral has adopted new 'default' size settings for 'Airwind' and 'Coldwind' Room Designer forms. Mistral Airwind and Coldwind room designer default setting now full screen and 200% zoom. Both new installations and installation upgrades will adopt full screen format with 200% grid zoom setting as default. Program users will naturally still be offered instant, infinitely variable form size adjustment from 575 pixel width X 424 pixel height and zoom levels of 50%, 100%, 200%, 400%, 800% and 1600%; along with default re-setting and other options including colour and 'snap to grid' changes via 'Options/Customize/General/Designer' at the top menu bar. 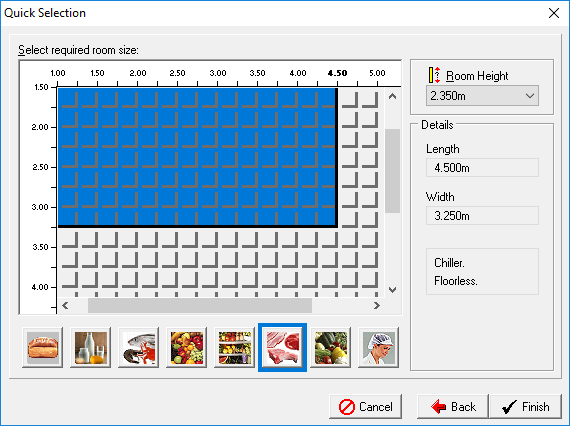 Maximum room sizes (in the absence of Special Feature Code application) remain as before at 100 metres X 100 metres in SI mode and 328' X 328' in Imperial mode. 'Coldwind' will design a coldroom or freezer and select the refrigeration equipment in less than 2 minutes. As everyone knows. But does everyone know that sister program 'Costwind' will also price that coldroom and generate the complete customer quotation? - Automatically and simultaneously! Yes. We know prices for coldroom shelving are well out of date in our databases. 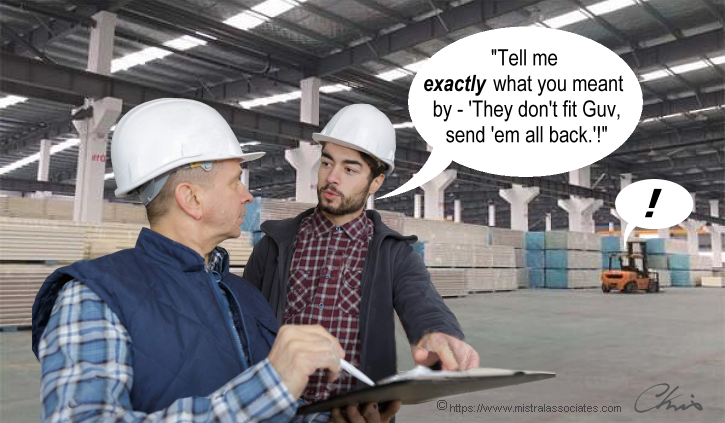 But tell your preferred shelving manufacturer and not us! Mistral have a strict policy to not publish ANY data without the express permission of the people who own the rights to that data. A policy designed to protect your interests. Assembling a large, interactive and often complicated database does not cost a few hundred Pounds. It costs thousands! Nonetheless, if your preferred shelving manufacturer really is afraid they'll end up selling more of their product by sending us their data for inclusion then we'll make it really easy for them. Mistral won't charge them a penny! That's right. We will crunch the numbers for them for FREE! All we ask is that they send us the data before Christmas and our slack period. Where we can get on with work relatively quietly. While everyone else is enjoying their traditional Christmas break. If they won't listen to us then perhaps they'll do the right thing and listen to you - their customer! Until recently refrigerant R744 has been the preserve of larger commercial and industrial refrigeration installations. That appears set to be changed. Beijer Italian subsidiary SCM Frigo S.p.A. have added a range of smaller critical low temperature, high pressure operating CO2 condensing units named Cubo2 Smart. 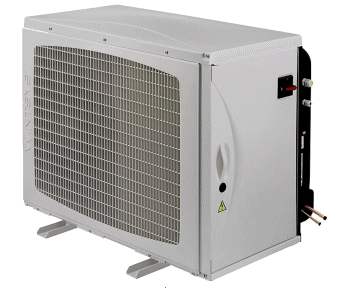 No point though in having smaller R744 condensing units without a range of matching HP (85 Bar) coolers. Leading RAC manufacturers Lu-Ve Contardo provide the solution with their ranges of R744 coolers. From small coldroom Panel Coolers, to larger (standard coldroom design) Unit Coolers to specialised application, Eg., food 'Prep Room', Dual Discharge Coolers. A formidable, high quality product array from this highly respected RAC equipment manufacturer. Mistral Associates are delighted to be honoured with access to comprehensive application engineering data for all the above products for addition to its already world's largest (probably) RAC equipment, interactive, database resource. 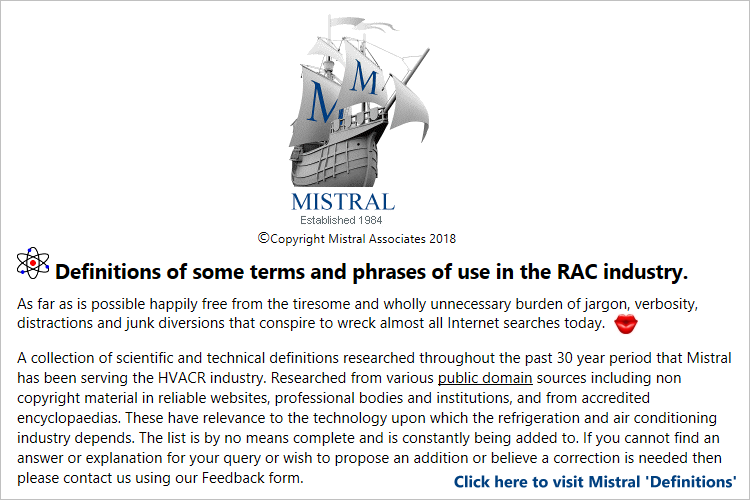 Cost to Mistral of researching, processing, compiling, proving and incorporating new interactive RAC R744 product selection databases: circa 12,500 to 13,000 Euros. 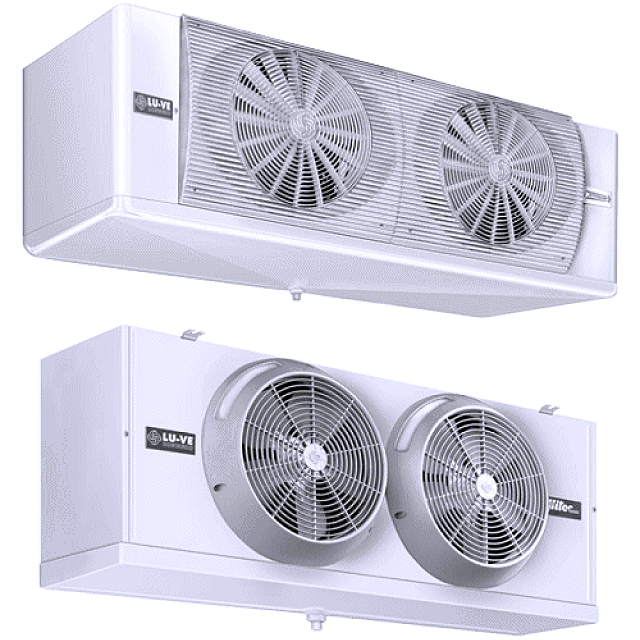 Mistral programs for Refrigeration and Air Conditioning Professionals were developed from 1984 in Western Europe, and where they have been constantly maintained ever since. Mistral programs have since been distributed in more than one hundred countries world-wide. This has naturally led to Mistral's development of program versions tailored to meet local cultural expectations. Mistral is pleased therefore to announce the release of its latest 'Corporate' compendium of RAC Application Engineering and Product Selection system in a version designed specifically for Halal practicing communities. Furthermore, at the same prices as for versions designed for various secular and other market places. Click icons in above graphic to access more details of key parts of the 'Corporate' compendium. Please be aware that above links can lead to web pages with content NOT found in the Halal program versions. * Please note that due to daily currency exchange rate fluctuations prices displayed may vary slightly. Large adverse differences (above UK£5) will be credited to on-line purchasers upon request. A little like 'Spot the Ball'. Except Mistral's little Red Dot isn't on a football pitch, it's on this website! A bit of a challenge then! Worth having a go though - It costs you nothing to enter and the prize could be worth thousands for the lucky winner! Click on the football above to read the easy rules. Are there any clues? Yes. The Red Dot isn't embedded in an icon, logo, animation (like the above animation!) or part of any text or punctuation. It's where you would not expect to find it! If no one appears to be getting even close then we will start publishing more clues right here. Competition closes 31 December 2018. Over 300 competition entries so far. But sorry, no one is even close. That's maybe our fault. Maybe we made it too difficult. Please forgive us, Mistral are experts in RAC Application Engineering software, but perhaps not in making on-line computer games! So, we'll offer you a few more clues. Just as we promised we would. First of all though we must remind you. The Little Red Dot is NOT embedded in an icon (website representation of a Mistral program button), or in a company logo shown on our website, or in an animated, video type graphic, or of course as part of text or punctuation. So please ignore all of those. Mistral's little Red Dot (and we've just made it a little larger!) is included in an image file. In a picture. Mr Olaf Börjeson from Norrköping in Sweden found our 'Little Red Dot'. Mr Börjeson is Managing Director of a family run Air Conditioning and Refrigeration contracting company that has been in business for more than forty years. With around 20 staff on his company payroll Mr Börjeson has just saved his company £5,750 (6,700 Euros) over the next ten years. And who knows how much more beyond? So our little competition is now closed. Better luck next time, for one of you at least, out of the nearly four hundred people that tried! For those wondering where Mistral's elusive 'Little Red Dot' was hiding:- geographic. Right over Mistral's offices in Bretagne, north-west France! Click map to go to Geographic page. New CUBO2 Smart housed CO2 condensing units. New interactive selection databases added. CUBO2 Smart condensing units by SCM Frigo, are inverter driven and available for both medium and low temperature applications. They range from 0.6kW-8kW in medium temperature and 0.7kW-7kW in low temperature. CUBO2 Smart condensing units are manufactured by SCM Frigo S.p.A. in Italy. Cost to Mistral of researching, compiling and proving databases: Over 600 Euros. Mistral's Cellwind and Linewind programs are now bundled for Linewind's original price of just £95. It couldn't be any simpler. But hurry. Santa returns to Lapland on 26 December and then the offer will be over. * If you have already bought licences to access both in the past then click on the above image and complete the form anyway. Tell us what other Mistral program you wish you had and we'll try and help. Mistral 'Definitions' & 'Scientific Factors' pages improved and restyled. A boon for teachers and trainers in our industry. So many Mistral program users are unaware the 'Mistral Definitions Index' even exists. Both on Mistral's website and also supplied with every program issued. Which is a shame! 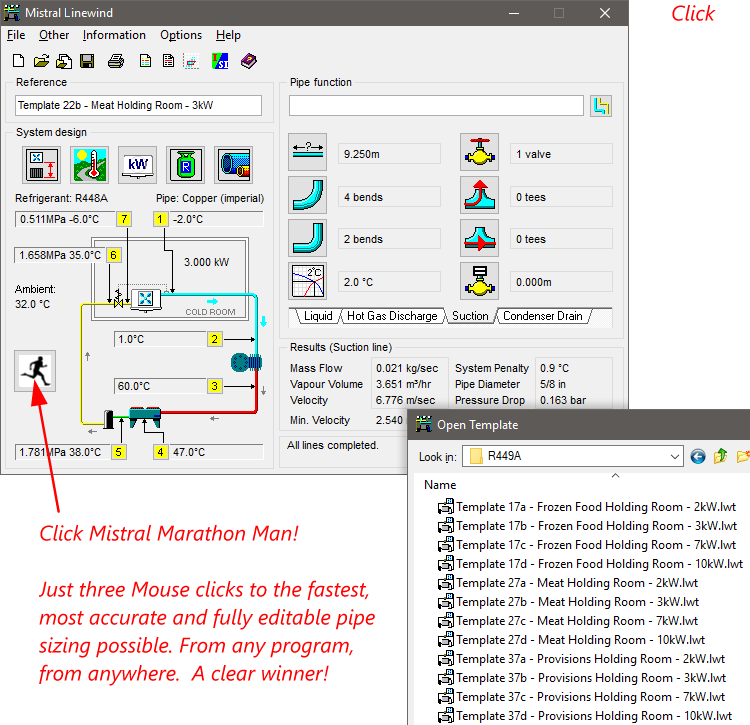 The link is found on the top menu bar of the Help Pages for 'Airwind', 'Cellwind', 'Coldwind' and other core programs. However, the few that do refer to it will welcome recent improvements and additions to this valuable educational and technical reference tool. Text has been made easier to read (in line with the process described in the News feature below) and page navigation made simpler. A minor detail but the irksome earlier version not centering on the screen has also been resolved. Finally, similar improvements have also been applied to 'Mistral Scientific Factors'. 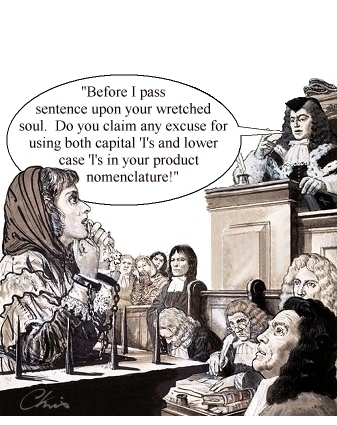 One of the largest and easiest to use (jargon and verbosity free! ) resources of its kind on the Internet. Over 1,050 useful scientific conversion factors. All gathered together in one easy to use alphabetically arranged resource. Next time you have to convert Btu/lb/Rankin to kilojoules/kilogram/Kelvin or vica-versa you'll know where you can find a reliable answer! "The impossible we do at once. Miracles take a little longer." We have all smiled at that sardonic comment at some time or another. It is a fact though that seemingly simple things to achieve in computer programming can cost literally thousands, even tens of thousands. Whilst the jaw droppingly impressive can often be put together in seconds and for next to no cost at all. A paradox. Deciding to upgrade fonts (the letters that make the words) in just a small part of our programs falls somewhere between the two. 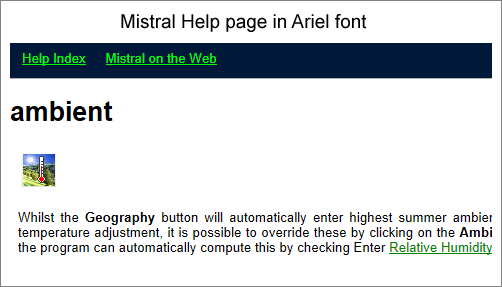 Due to another paradox created by the recent advent of larger, high resolution, flat screen monitors; actually resulting in smaller and more difficult to read text, Mistral has been forced in some instances to abandon its favoured and Microsoft recommended font of decades, Ariel, in favour of the more modern and legible Segoe. We hope you like it. It cost us more than we were expecting! 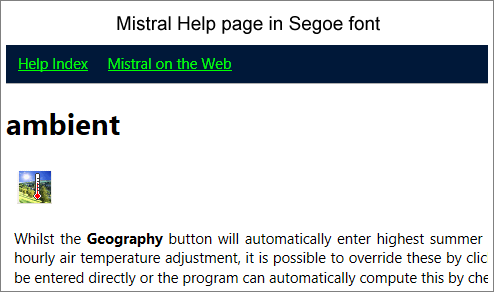 Cost to Mistral editing illustrated Help pages to accomodate new font: 6,500 Euros. At the same time we overhauled our website too. Cost 11,000 Euros. The United Kingdom is a renowned world leader in food 'Cold Chain' technology. Refrigerating food from 'Field to Plate'. What is perhaps less well known is just how much of this advanced refrigeration technology is exported to other countries. From Afghanistan to Zambia along with all points inbetween. Professional Refrigeration Engineers recognize that all new refrigeration projects start with the heat load calculation. Hence the reason Mistral's 'COLDWIND' load calculation program began its life over a third of a century ago. What is also often not appreciated is that 'COLDWIND' is under constant, daily development. Not just to maintain it so as to keep abreast of unrelenting advances in computing technology but also to reflect changing needs and new challenges in the commercial refrigeration industry the program serves. One of these challenges is constantly updating and adding to 'COLDWIND's vast interactive database of actuarial, meteorological data. 'COLDWIND' is capable of calculating not just 'worst case' results for refrigeration projects, but also energy profiles at 15 minute intervals for every day of the year, in tens of thousands of world locations. 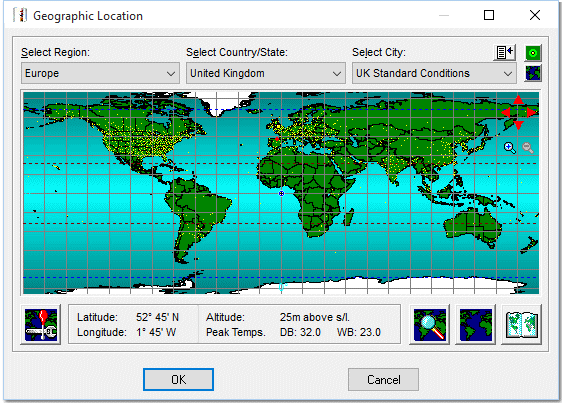 With no more than a couple of mouse clicks on thousands of world maps, or alternatively by simple to follow, alphabetically arranged, country by country menu selections. Research in meteorological data is a surprisingly complicated and generally quite expensive process. Official sources that have invested huge amounts of money gathering and formulating reliable, certified meteorological data don't often hand it out freely to just anyone that comes along and asks for it! And not unreasonably they ask to be paid for it. Good to know then that over the preceding nine months Mistral has found, purchased and added meteorological profiling data for another 200 or more primary world locations. Thereby further helping refrigeration companies involved with designing refrigeration installations in locations all around the world. 'COLDWIND's meteorological interactive database is shared by both 'AIRWIND' and 'CELLWIND' and also Mistral's Shareware program, 'METWIND'. Cost to Mistral researching & compiling Meteorological database edits: 1,300 Euros. Following the huge and sustained fall in value of the UK Pound against other leading world currencies trading has proved increasingly difficult for Mistral Associates. It comes as a surprise to many people, especially those adhering to the myth that software developers have a 'Licence to Print Money', but the fact remains that software development is an extremely hazardous business to be in. Margins are very small and the risks very high. Explaining perhaps the reason why over 90% of all software companies cease trading or go bust within their first five years following start-up. There are exceptions of course. Microsoft Corporation, (and with no fear of accusations of libel!) with their dubiously ethical trading practices are one. Social media software companies are others. Though many of these are actually only supported by overly optimistic stock brokers and have actually yet to make any profit at all! Just to remind everyone. The 'Dot Com' crash of the late twentieth century was no myth. That was FACT! Mistral Associates are different though. Although occupying a clearly even more hazardous 'niche market' sector Mistral has been successful since inception over a third of a century ago, and where its imitators and plagiarists have all largely since disappeared. Why? Lots of reasons. Not the least of which is the high quality of its product and service but also its dogged refusal to diversify and finally its celebrated very fair pricing policy. Do you remember Mistral's promise? Mistral's prices are 'FIXED IN PERPETUITY' (subject only to inflation). Well we are afraid that the 'subject only to inflation' time has come. 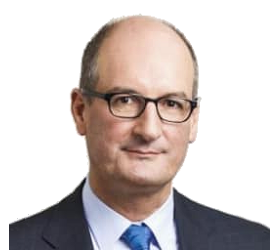 A whole twenty five years after our last major price review, and in the light of the disastrous effect the Brexit debacle has had on the value of the Pound, we now have no choice but to increase our selling prices if we are to remain in business. However there is still good news for our large number of loyal customers, many of whom have accounts going back with Mistral for twenty five years or more. We will still not increase our prices to you. For the time being at least. And even when we are ultimately forced to do so it will still be by amounts well below cumulative inflation rates for the time period. 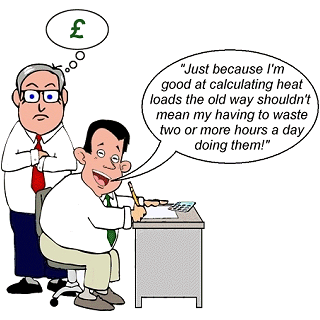 Please also do note that even with these new prices access to the world's most comprehensive Expert Software System for the Refrigeration & Air Conditioning industry, and certainly the best maintained and easiest by far to use, remains at only a few pence/cents per day, or even less, per user! Yes. We've all heard the joke. Boss: "I feel as though I'm a mushroom." Boss: "Because I'm kept in the dark and everyone keeps throwing s**t at me!" Well now you don't have to be kept in the dark. At least not as far as how to help mushrooms keep their cool. Resulting from a couple of recent requests for help from valued clients a piece of research conducted by Mistral revealed that more than just a few users of Coldwind Pro have helped mushroom growers' businesses over the years. And whilst the thermal properties of mushrooms have been included in Mistral's Coldwind Pro's 'Food Products' databases for decades, the medium mushrooms are cultivated in has not. Further research revealed that right across Europe and North America, what is described as Mushroom Compost generally consists of similar ingredients. That is:- Alfalfa hay, Cattle or horse manure, Corn stalks, Oat straw, Poultry litter, Sawdust and wood shavings, Silage, Soil, Soybean, Wheat straw. Naturally there are regional variations and also varying proportions of ingredients. However the basic principal and composition of the compost mixture is roughly the same. 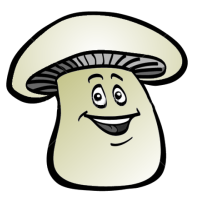 Mistral has therefore been able to estimate 'mean (high) average' properties for mushroom compost and which should be safe for all practical commercial purposes. This data has now been added to Coldwind Pro's Food Properties database; under the 'Miscellaneous' group heading. Cost to Mistral of researching, compiling and proving database edit: Over 800 Euros. For more than 25 years Coldwind, along with its later professional feature enhanced version Coldwind Pro, have had minimum Product turnover limits set at 2 kg per cubic metre room volume per cycle. This of course to protect program users from inadvertently or mistakenly including product loads far too low to reflect likely usage. However, the lower limits, as low as they were nonetheless frustrated attempts to add and accumulate a mixture of additional products from which the overall calculation result might benefit. As shown in the above example where although the principal product load might be attributed to wine, calculation accuracy would be enhanced by simultaneous calculation of the load for the bottles in which the wine is contained, the cartons in which the bottles are contained and finally the pallets or stillages upon which the wine cartons are placed. There are of course hundreds more product storage situations where this applies. Although probably not making much difference for a 1,000 cubic metre cold store, experience has shown this calculation enhancement becomes much more important in examples of super sized distribution centres of 40,000 cubic metres, 80,000 cubic metres and more recently some of even more than 120,000 cubic metres. Mistral's expert system software is constantly evolving to meet new challenges in the industry. Cost to Mistral of researching, compiling and proving database edit: Over 3,300 Euros. Tecumseh New Wintsys housed condensing units. Tecumseh's New Wintsys condensing unit range are assembled in France. Cost to Mistral of researching, compiling and proving databases: Over 1,300 Euros. This database, one of more than 17,000 interactive databases in Mistral's complete systems, was sponsored by Hawco Refrigeration of Godalming, Surrey, United Kingdom. 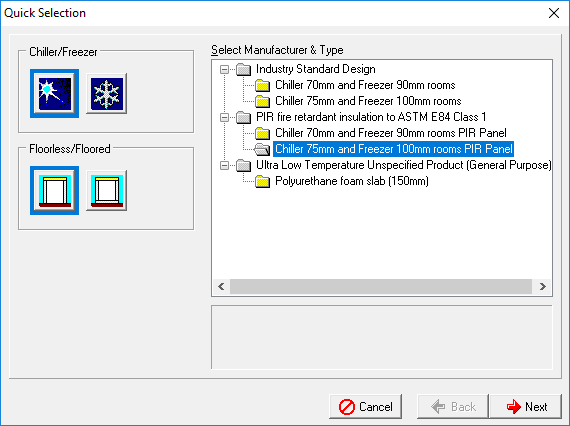 PIR Fire Resistant insulation materials added to 'Coldwind Pro' Quick Selection 'Pre-engineered' cold room and freezer designs databases. Cost to Mistral of new 'Quick Selection' database update development and proving: Over 2,000 Euros. Open Source software. A reminder! Mistral has offered Open Source templates of in-house developed multi-relational databases from the firm's earliest days. Along with free access to Mistral's Treedb32.exe database creation and editing tool. Exactly the same tools Mistral uses to create and maintain the tens of thousands of program interactive databases distributed with every issue of Mistral software. These are supplied with rudimentary* Help pages outlining critical code that is need to enable user created databases to be recognized by and run in Mistral programs. For example for selecting refrigeration and air conditioning capital equipment or for coldroom cost estimation and customer sales quotation generation. Mistral will happily provide developers a limited amount of advice and support at no charge. Providing developers have suitable qualifications or demonstrate aptitude in programming. *Prospective code developers are assumed to already possess necessary programming skills. Mistral Associates cannot be expected to provide basic training. Novices are also warned that acquiring such skills comes neither easily nor quickly and can, indeed usually does, take years! Proprietary RAC equipment selection databases supplied with Mistral programs are locked and cannot be edited. RAC Equipment Selection Databases - Notes for Programmers. RAC Equipment Selection Databases - zip file of sample open source database templates. Mistral has added another 21,948 new 'Quick Selection' coldroom & freezer designs to 'Coldwind Pro's' grid size room optional operating procedure. Bringing the number of almost instantly selectable pre-engineered coldroom & freezer designs to a total of 102,256! Anyone claiming computer programs aren't necessary and that they can do the job faster is willing to try. Providing they can conduct over 175,000 intricate and inter-related calculations per second then they might stand a chance. If able to prove they are both faster and more accurate than 'Coldwind' Mistral will reward them with free program access - FOR LIFE! Each design is in effect a complete 'pre-engineered' cold room or freezer design file and which has been created reflecting current industry specifications and design standards. These files can be opened, edited if required and re-saved. Behaving in exactly the same way as using 'Coldwind Pro' to produce a custom design. 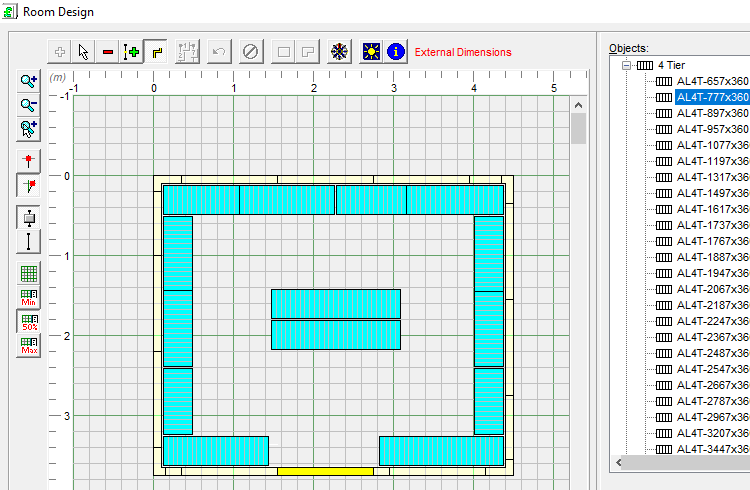 So astonishingly simple and quick to select that most experienced 'Coldwind Pro' users generally take just ten to fifteen seconds to click on the 8 to 10 buttons needed to design a new coldroom or freezer from scratch. Then another ten seconds if they wish to automatically print out a detailed, presentation quality, illustrated summary report. Even users totally new to the program manage to unambiguously locate exactly the design they need in only a few seconds more. The best that an equally experienced and qualified refrigeration engineer could match 'Coldwind Pro' for accuracy and completeness of a similar design, armed only with a calculator and a few pages of tables, took a little over two hours! An even more interesting fact to emerge from Mistral's extensive field trials is that if the same engineer is asked to repeat exactly the same manual calculation exercise a second time around just a few hours later then they will invariably come up with a different result to their first attempt! 'Quick Selection Charts' published as aids by many RAC equipment manufacturers and distributors have also been shown to overestimate refrigeration loads by anything from 10% to as much as 30% when compared to Mistral's proven computerised calculations. click above image to discover whether you're wasting money! Cost to Mistral of new 'Quick Selection' database update development and proving: Over 4,000 Euros. Mistral's trial reduced rate annual subscription for sole traders and single user licensees has now been made permanently available. Following a highly successful trial launch in December 2017 Mistral's new 'Subscription' licence product, offers identical benefits to the long established and popular 'Corporate Licence' except it is now offered for smaller business users, sole traders, independent consultants and students. A substantial 67% saving against previous price! Click here:- Annual Subscription for immediate purchase and same day* complete system download and access. * Within 24 hours. Please be aware of international time zone differences from CET. Refrigerant R513A (Opteon TM XP10) non-ozone depleting, low global warming potential (GWP) added to Pipewind Pro - Professional RAC pipe sizing program. Ideal successor to R134a for medium/high temperature applications. R513A interactive database. Cost to Mistral of data processing, compilation and proving: 1,750 Euros. One of more than 17,000 independently verified, interactive databases available to Mistral Corporate Licensees. World's largest independent collection. A world leading and highly regarded refrigeration equipment manufacturer. 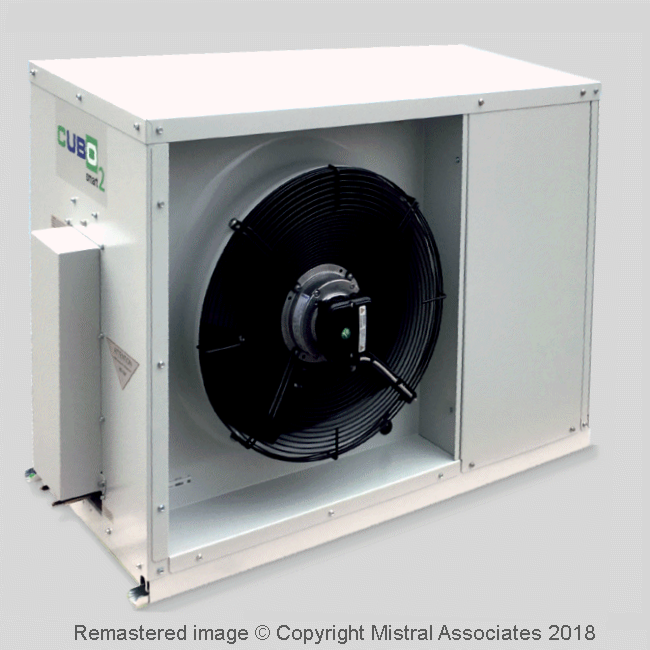 Mistral's proposed new interactive databases for selections from Lu-Ve Contardo's commercial range of coolers will be an operating conditions sub divided grouping comprising 'drill down' to 138 individual product sub-databases. By the time all options and currently available refrigerant data are considered. All levels accessible through maximum of three button clicks from opening of main database. Estimated databases total size from 3.0 to 3.4 mBytes. *Now released. Sunday 18 February 2018. Free download from this page for all Mistral 'Corporate Licence' subscribers. Cost to Mistral of Lu-Ve Contardo databases development and proving: 8,500 Euros. 2017 saw the culmination of an 18 month critically important recoding project. Affecting all 12 Mistral main program engines. New program families were rolled out from early July to end of December 2017. Changes to program installation and to file and database saving procedures. Real Mistral sales story from 1998. Sometimes friends need a little help before they can see the wood for the trees!